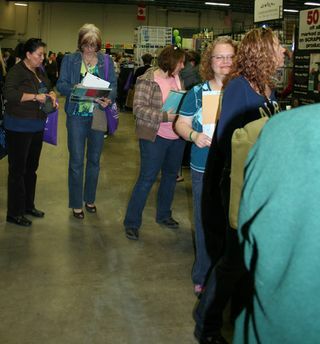 A big thank you to everyone who stopped by our booth this weekend in Kitchener and made the show such a success. We were super busy as you can see the photo…the line goes down and then curves around. Everyone was taking advantage of our below cost prices as I tried to clear out inventory. 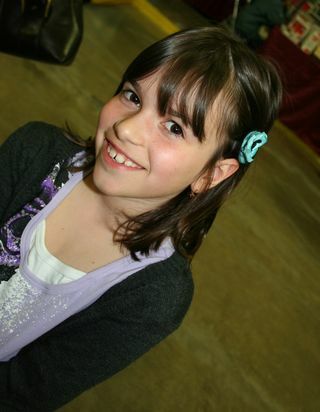 I was delighted to sell quite a few of my jewelry pieces even though it was a scrapbooking show. One little girl dragged her Mom into the booth and got this little hair clip…she looked so cute I had to get a photo of her with it. I was so happy to meet some really cool people during the event. Lorrie Everitt is a super talented artist who came by the booth. Gail Merritt-Murrell is a Stampin' Up demonstrator. Thanks to all the lovely ladies and vendors that stopped by and bought up my jewelry! : ) The ladies from The Scrapping Nook, Elizabeth Nardella from A Scrapbooker's Dream, Karen Ellis from The Art House Studio, the gals from Scrapbook Queens, Jodi and her whole family from Scrapbook Memories in London. Thanks for being such great neighbours!